Le musicien et compositeur Rhys Chatham a atteint le statut de légende dans les milieux musicaux expérimentaux ; il est souvent mieux connu pour ses symphonies écrites pour des centaines de guitares. Rhys Chatham malaxe le son de ses instruments, la trompette et la guitare, avec force pédales d’effets et dispositifs électroniques. Accompagnant la musique, Angie Eng crée ses images en temps réel avec des manipulations d’objets superposées à des séquences d’animations de “psycho geometry”, de symboles magiques. Elle décrit sa vidéo comme un ciné-poème énigmatique scintillant, animé par des sauts d’image et des lumières volantes. Rhys Chatham and Charlemagne Palestine in duo at the All Frontiers 2013 Festival. Other Minds presents A Secret Rose for 100 electric guitars, one electric bass, and drums.Sunday – November 17, 2013, 7:00 PMOther Minds presents the West Coast premiere of Rhys Chatham’s A Secret Rose (2006) for 100 electric guitars November 17, 2013. A monumental work based on his 1989 composition An Angel Moves to Fast to See, A Secret Rose will feature an orchestra of 100 electric guitar players from the Bay Area and abroad in the performance of a single five-movement orchestral scale piece at the historic Craneway Pavilion in Richmond, California. An incredible opportunity to see two giants in contemporary composition perform together. Jørgen Teller’s multi-colored soundscape of the metropolis is brought to life by Wubkje Kuindersma (dance and guitar), Randi Pontoppidan (vocals and effects), Rhys Chatham (trumpet, guitar and looper), Jennifer Dill (flutes), Linda Edsjö (vibraphone and wood), Fast Forward (metal objects), and Christian Rønn (grand piano prepared with glass and rubber) – and Jørgen Teller on vocals, guitar, short wave radio and synth filters. Amongst other things. A genuine New York legend, Rhys Chatham studied under Morton Subotnick and La Monte Young, and played in the drone ensemble The Dream Syndicate with Tony Conrad, before emerging as a minimalist composer. The impact of Punk and No Wave inspired his seminal “Guitar Trio” and other pieces for large guitar ensembles, sometimes involving hundreds of players. In recent years, he has been exploring the trumpet as a medium of improvisation and minimalism. We are delighted to be able to walk the halls of the Dream House again as we did the first year of Hunters Moon with Tony Conrad! 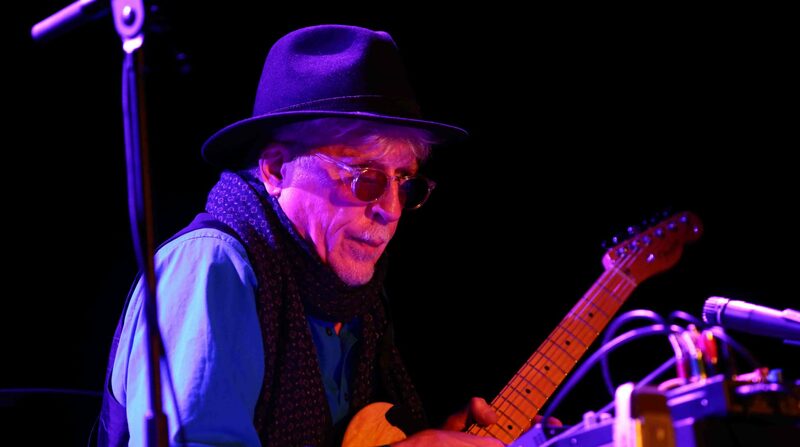 Please welcome Rhys Chatham on his first ever trip to Ireland. Two of America’s most renowned minimalist /avant-garde composers will perform live together for the first time in over three decades. A former member of Tony Conrad’s The Dream Syndicate, Chatham first became widely known as one of the key figures of New York’s No Wave scene in the late 1970’s, whilst Palestine was a contemporary of artists such as Philip Glass, Terry Riley and Steve Reich – although his intense, ritualistic music also places him in a zone all his own. Written in 1977, Guitar Trio is Rhys Chatham’s signature composition, and with good reason. With a single, repeated chord, Chatham permanently altered the DNA of rock by splicing the gritty, overtone-drenched minimalism of John Cale and Tony Conrad with the elemental fury of the Ramones. The amalgamation was inspired. It energized the downtown New York scene throughout the late 1970s and early 1980s, and made Chatham a founding father of the notorious No Wave movement. The influence of Guitar Trio spread even farther as former ensemble members carried its shimmering swagger into the rock mainstream. We’ll be mounting G3 in Denmark on 7 September in Copenhagen. The concert will be at Jazzhouse. Playing will be Rhys with guitarists Oliver Hoiness, Ask Kjærgaard, Jørgen Teller, Alexander Bossen, Lars Bech Pilgaard. Jeppe Skovbakke on electric bass, and Rune Kielsgaard will be playing drums. Rhys will be playing G3 in Aarhus, Denmark at the Atlas with guitarists Oliver Hoiness, Ask Kjærgaard, Jørgen Teller, Alexander Bossen, Lars Bech Pilgaard, Uffe steen, Kim Jeppesen, Anders Birkekjær, Kasper Solhøj Kristensen. Jeppe Skovbakke on electric bass,Rune Kielsgaard will be playing drums. Rhys Chatham plays G3 with musicians from the region of Zagreb, Croatia., in the context of Breakthrough! Festival, a new trans-disciplinary project named Breakthrough which is walking the line between sound and visual arts. The Project was conceived as a platform for different kind of arts, not confined by genres, exceeds set stereotypes, presenting innovative and interesting forms between performance, theater, installation and visual art, but with a strong focus on music- sound. Taking place in Museum of Contemporary Art, Zagreb. Rhys Chatham performs with Oneida at the ATP Festival in Chamber Sands, UK. The event is curated by Deerhunter, with many other fine acts performing, including Kim Gordon with Ikue Mori, the Tom Tom club, Pere Ubu, and of course my friends of Deerhunter will be performing, too. Rhys Chatham performs with Oneida at La Sala Rossa on Montreal as part of the Suoni Per Il Popolo Festival. Rhys Chatham performs with Oneida.